This calming reminder of mindfulness is inspired by a Tibetan prayer wheel. 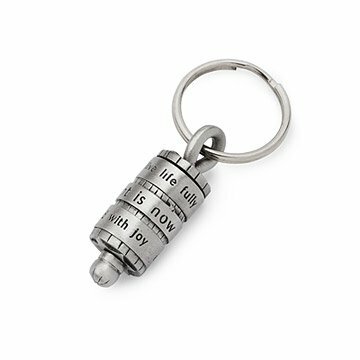 Carry a calming reminder of mindfulness with this talisman keychain. Featuring the phrases "The moment is now" and "Live life fully and with joy" in three rotating sections, Emily Rosenfeld's design is inspired by Tibetan prayer wheels. It's a tactile, portable way to focus on the moment and center yourself while on the go. Handmade from pewter and stainless steel in Massachusetts. After graduating college with a degree in English, Emily Rosenfeld started working for production jewelers Lewis and Hubener, where she stayed for two years. Working with jewelry made her realize that she wanted to earn her living with her hands and with her eye, and she moved to Oakland, California, started studying in workshops and began to make her own jewelry in 1991. For two years, she ran her business out of a Murphy bed closet, then moved to New Paltz, New York before finally settling in Western Massachusetts. Her studio there is a converted factory building filled with other artists, where she feels continually inspired to develop new designs and play with new materials and techniques. She says of her jewelry, "Making my work makes me very happy; I hope owning it brings a measure of joy as well." I expected the key ring to be larger, the craftsmanship Seems very good. I love this key ring! I put a clip on it so that I can attach it to my belt loop or purse and it makes it so easy to find my keys! I love the message that the moment is now! It reminds me to take a deep breathe throughout the day and live for today! Great product!